Our London Dry Gin is lovingly distilled from eight local botanicals that grow within a mile of the distillery in the fields, woods and orchards beneath the Greensand Ridge. We marry these with seven carefully selected classic botanicals to create an exceptionally smooth and delicately balanced premium gin. Our London Dry Gin is lovingly distilled in small batches from a carefully selected combination of fifteen botanicals, each of which plays an important role in creating the delicately balanced flavour profile. The resulting gin is fantastically rounded where no individual botanical dominates. On the nose, aromatic citrus and pine give way to a full and complex warming sweetness on the palate. A hint of nuttiness carries through to the finish, complimented by a gentle floral, aromatic quality. Creating a Gin which reflects our region's flavours meant assessing the flavour profiles of over 30 indigenous botanicals. We selected eight local botanicals which each brings an important character to our Gin, all of which can be found growing wild around our distillery. We marry these with seven classic botanicals which bring resinous, spicy and citrus characters to the lineup. Cobnuts are the backbone to our Gin with their high oil content they contribute an amazing length and mouthfeel. 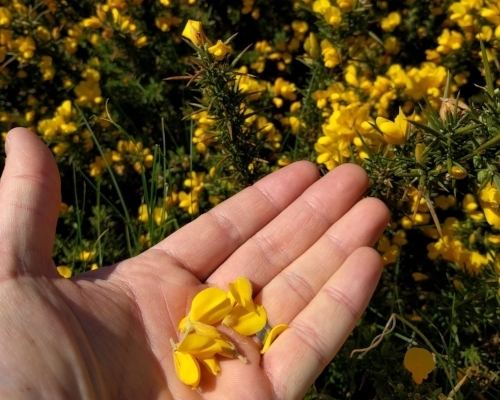 Gorse Flowers have an amazing vanilla/coconut scent which we use sparingly to add a floral note to the finish. Oak Moss has an earthy, grassy aroma and acts as a fixative to bring harmony to the botanical mix. Honey delivers a floral sweetness long into the finish. Rosehips offer a slightly tart sweetness. Hawthorn Berries give a hint of bitterness and spicy astringency. Bay Laurel adds a rounded woody sweetness which bridges between the earthy/nutty and floral/sweet aromas. Poppy Seeds have a warm nutty character which contributes a base note to the Gin.